Now that you’ve discovered the basics of macronutrients and how they relate to your caloric intake, let’s talk about some different aspects to look at regarding our food nutrition labels. The food industry is sneaky. While it has to disclose most information about its food products, it doesn’t have to educate you on how to decipher its labeling. Remember, the more educated you are about your foods the less the food industry can persuade you with savvy marketing ploys. So being conscious of what you’re digging into will allow you to make more informed decisions of what (and how much) you’re consuming. 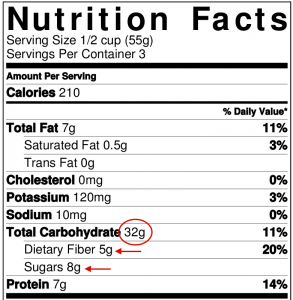 Here’s a little bit of information on what to look at/for when you’re reading those obscure numbers on the nutrition labels of your foods. Remember, this number is rounded. So now that you know how to calculate your macros and why it’s more important than simply tracking calories, just use this number as a general reference if you want to know how much energy you’re consuming. This first number is going to be your TOTAL amount of fat in the serving suggestion. this includes unsaturated, saturated, and trans fats. a.) Saturated fats: Saturated fats have been given a bad rap for the wrong reasons, blamed for causing heart disease and contributing to obesity. Recent research is proving this not to be so true. In fact, eating too much of anything (more calories than you burn) is the leading contributor to these diseases. Fun fact: Saturated fat has recently been shown to improve brain functioning, nerve signalling, and immunity just like other fats do. It could also be a possible precursor to increased testosterone in males. Some reviews (here, here, or here) found that those who consumed higher amounts of saturated fats have no higher rates of cardiovascular diseases than those who consume less. Other studies (here, here, or here) concluded that replacing saturated fats with healthier types of fats lowered LDL (“bad”) cholesterol. One thing that’s know for sure, is that it is paramount to consume adequate amounts of omega-3 fats in the diet to ensure a healthy heart and blood. Bottom line: don’t worry so much about saturated fats as long as you’re getting in an appropriate level of unsaturated fats like omega-3’s every day too. The saturated fats listed on your nutrition labels have already been included in the total grams of fat listed above it, so don’t count them separately. b.) Trans fat: This fat is a byproduct of partially hydrogenated oils, and is added to foods to help increase flavour and shelf-life stability. It has been banned in many countries and the FDA no longer recognizes it as “safe”. It has been shown in many studies to increase our risk of cardiovascular disease when commercially produced. It naturally occurs in small amounts in some animal products, but a recent review didn’t find any links to increase health concerns with it. Bottom line: Try your best to avoid it. So far, science has done a great job linking the commercially-produced trans fats to the increased risk of many health problems. Like saturated fats, any trans fats listed will have already been included in your total fats above. The trans fat and saturated fat in your food product usually WON’T add up to your total fat numbers. As we can see above, 0.5g of saturated fats + 0g trans fats DOESN’T add up to the 7g of fat listed above. This is because most nutrition labels don’t include grams of unsaturated fats in their foods. They would merely be included in your total fat numbers. While it has a bad rap, cholesterol is a molecule naturally made in the body, and it’s critical for our cells to adapt to temperature fluctuations, produce hormones, and even help us digest our food. There is NO convincing research to support the claims that cholesterol is the cause of heart disease and atherosclerosis. In fact, many natural sources of cholesterol (like eggs) are more beneficial than harmful for us- not to mention they contain important vitamins and minerals along with healthy fats). So unless you have a pre-existing heart or artery condition and your doctor recommends you avoid cholesterol in foods, don’t worry so much about it. As a mineral, it doesn’t contain any calories. Just like saturated fats and cholesterol, it has a bit of a bad reputation. While many studies in the past have correlated sodium intake with high cholesterol, one must realize high sodium usually comes with an unhealthy diet overall, which will increase your risk for many chronic diseases. But sodium intake itself has actually not been proven to cause fat gain over long-term ingestion, and frankly, your body needs it to function. Sodium is crucial for every single cell in your body, especially for nerves and muscle to function optimally. Consuming excess salt has not been linked to hypertension either, and it has been found to be especially beneficial in bodybuilders. Yes, inconsistent levels of sodium (say, an irregular amount in one or two days) will cause short term weight gain due to water retention. The bottom line: Unless you already have high blood pressure, kidney problems, are salt-sensitive, or have another condition that requires a low-sodium diet, I wouldn’t stress too much about your sodium intake. always make sure you’re drinking plenty of water. The number of carbohydrates are going to be your TOTAL carbohydrates, including sugar, fiber, and starches. Dietary fiber: Fiber is extremely important in the diet, and is cited to be a big indicator of regulating your digestive health and increasing feelings of satiety (so you’re fuller longer). I have a full post about the importance of fiber. But, bottom line, make sure you’re getting enough! Fiber will give you a LOWER caloric value per gram than other carbohydrates, but still include your fiber count in your overall carb intake, as it is broken down and utilized quite well in the large intestine for energy. Sugar: This is a huge discussion topic for me (check out my post on sugar here), and the source of many health misconceptions. Sugar is not inherently “BAD” like many people preach. Yes, too much sugar is not going to help you or your blood sugar levels so moderation is probably best. But sugar in all forms is a carbohydrate and news flash: ALL carbohydrates you eat will be broken down into glucose before it enters your blood for transport to the rest of your body. As long as you’re getting in enough fiber throughout the day and staying within your caloric limits (hitting your macros), you won’t be gaining weight if you eat a little bit of the sweet stuff. Fun fact for all you agave-loving fructose-hating people: The type of sugar you’re consuming doesn’t make you gain any more weight than another type, since they all have the same caloric value per gram. If you’ve read my post on the basics of macronutrients, you know the importance of protein in your diet, so be sure to look out for higher-protein foods if you have trouble getting in enough! What are those numbers on the right? Those are your percent daily value, or %DV. This value is based on your country’s valuation of a “healthy” standard diet. It is usually based on a 2,000 calorie diet. If you are tracking macronutrients, then you will have been given a specific nutrient and caloric amount that is INDIVIDUALIZED to you. Therefore, I usually find it helpful to just ignore these numbers as they will only confuse you. 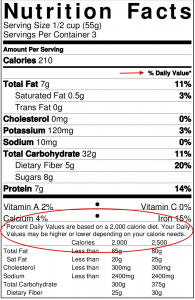 If your nutrition labels states percentages of your “standard daily value” on the right, they will more than likely explain their nutrient breakdown below the label or somewhere else on your food packaging. 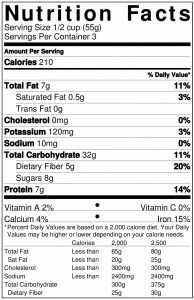 Being able to fully interpret nutrition labels is going to be an important tool in your arsenal of dietary intelligence. It is not obsessive, it is being aware of what you’re buying and consuming on a daily basis (and that’s why companies HAVE to put nutrition facts on things). The more aware we make ourselves, the less we can be coerced by unrealistic marketing. So go forth, interpret your nutrition labels, and conquer the convoluted world of human nutrition.